What Is It Like To Ride In A Hot Air Balloon? From the neophyte adventurer to the seasoned veteran, from the young to the more mature. “A magic carpet ride” and “riding on a cloud” are two phrases that have been used to describe the beauty, exhilaration and gentleness of ballooning. Even though you travel at speeds of five to six miles per hour, there is virtually no sensation of motion because you are flying with the wind. Your Arizona flight begins with the inflation of the balloon by motorized fans. Once the envelope is filled with air, the propane burners are ignited to heat the air inside. In about thirty minutes the balloon is ready for flight. Upon inflation, you will join your pilot in the beautiful hand-crafted wicker basket. The luxurious, over-sized basket has plenty of room to allow everyone to enjoy the Arizona flight to the fullest. As you gently leave the Earth, you’ll be amazed at how light the balloon feels. During the flight you have unobstructed 360-degree views, allowing for breathtaking photographs. Your pilot will explore a variety of altitudes, up to 3,000 feet in the air for a marvelous overview of the valley, to just under 400 feet from the ground where you are able to see the sights and sounds of desert life. Your pilot will point out exotic desert plant life below and descend within inches of trees and cacti, much to everyone’s delight. You will be amazed at the excitement and curiosity generated by the passage of our balloons. Occasionally, cars will follow us over the narrow dirt roads in the desert to rendezvous with us after landing. 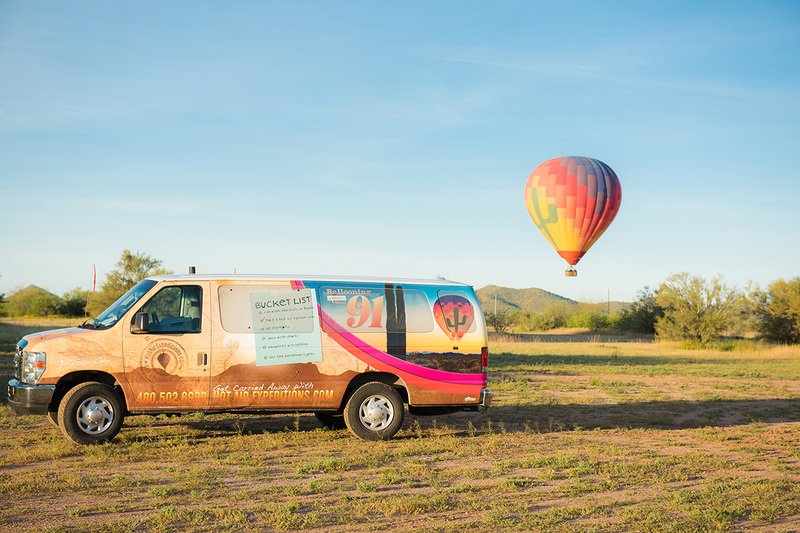 Throughout your Phoenix hot air balloon ride, our ground crew follows your balloon over desert lanes and roads so that they can be ready and waiting for you upon landing, always a momentous occasion. A lovely table complete with linens and china awaits you in the heart of the desert, a clue to what you are about to enjoy! You are greeted with a traditional celebration that includes scrumptiously prepared gourmet cuisine from the award-winning Vincent’s on Camelback restaurant. First-time flyers will be treated to the legendary Balloonists Ceremony that balloonists all over the world have been sharing for more than a century. And finally, to prove your difference from ordinary mortals, you will be inducted into the ballooning society and awarded the Certificate d’Ascension En Machine Aerostatique, a truly unique experience.